Kōnane is a two-player strategy board game from Hawaii. It was invented by the ancient Hawaiian Polynesians. The game begins with all the counters filling the board in an alternating pattern of black and white. Players then hop over one another's pieces, capturing them similar to checkers. The first player unable to capture is the loser; his opponent is the winner. Before contact with Europeans, the game was played using small pieces of white coral and black lava on a large carved rock which doubled as both board and table. 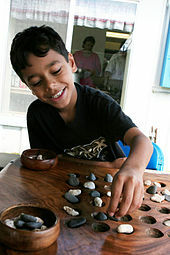 The Puʻuhonua o Hōnaunau National Historical Park has one of these stone gameboards on its premises. The game is somewhat similar to draughts. Pieces hop over one another when capturing; however, the similarities end there. 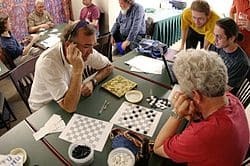 In draughts, one player's pieces are initially set up on one side of the board opposite the other player's pieces. In Konane, both players' pieces are intermixed in an alternating pattern of black and white that fills the board. Furthermore, in Konane all moves are capturing moves, captures are made in an orthogonal direction (not diagonally), and in a multiple-capture move the capturing piece may not change direction. Konane's closest relatives are Leap Frog and Tjuki, and these games form a family of their own. The game is played on a rectangular or square board. Pieces can be laid out in the beginning of the game in an alternating checkerboard pattern of two colors on top of a table, on the ground, or on any flat surface. Furthermore, the game can be generalized to any size geometrically. In practice, square Konane boards can range from 6x6 to over 14x14. Traditional rectangular board dimensions include 9x13, 14x17, and 13x20. The first player unable to capture an enemy piece is the loser, and the other player is the winner. There are no draws in Konane. The game begins with all the pieces on the board (or table, ground, etc.) arranged in an alternating pattern. Players decide which colors to play (black or white). Black traditionally starts first, and must remove one of its pieces from the middle of the board, or from one of the four corners of the board. There are 4 pieces (2 black and 2 white diagonally opposite each other) that form a 2x2 square array in the middle of the board. Black can either remove one of those two black pieces, or remove a black piece from one of the four corners of the board. The four corners of the board will also consist of two black pieces and two white pieces that are diagonally opposite from each other. White then removes one of its pieces orthogonally adjacent to the empty space created by Black. There are now two orthogonally adjacent empty spaces on the board. From here on, players take turns capturing each other's pieces. All moves must be capturing moves. A player captures an enemy piece by hopping over it with their own piece similar to draughts. However, unlike draughts, captures can be done only orthogonally and not diagonally. The player's piece hops over the orthogonally adjacent enemy piece, and lands on a vacant space immediately beyond. The player's piece can continue to hop over enemy pieces but only in the same orthogonal direction. The player can stop hopping enemy pieces at any time, but must at least capture one enemy piece in a turn. After the piece has stopped hopping, the player's turn ends. Only one piece may be used in a turn to capture enemy pieces. The player unable to make a capture is the loser; his opponent is the winner.